Are you looking to buy Tungsten Alloy Crankshaft Rod in specific size, price and specification? If yes, then send us an inquiry now. We are manufacturing these rods that have features of high melting point and very high density, almost double that of steel. These are also over 50% heavier than lead - a most crucial factor in condition where 'high weight + low volume' is needed. 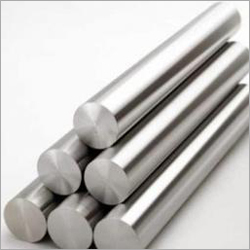 Some special properties of Tungsten Alloy Crankshaft Rods are high tensile strength (700 to 1000 Mpa) and high density (16.5 to 18.75 g/cm). Low thermal expansion, good weld-ability & machine-ability, and great corrosion resistance are some other attributes of this rod. Further, prolonged life of Tungsten Alloy Crankshaft Rods is ensured via it's wearable feature. This also helps the companies in saving regular costs. Many clients use these rods for their crankshaft counterweight requirements. Tungsten Alloy Crankshaft Rods are designed to sustain the higher engine speeds. These available crankshaft rods have good corrosion resistance, weld ability, low thermal expansion etc. owing to which these serve for long period of time in an effective manner.